Arlington Wreath Photo Started It. Now Local Heroes Honored, Too. More than 4,000 military veterans are buried in Clovis cemeteries. And, a local nonprofit ensures their sacrifice isn’t forgotten. “Our mission is to remember, honor, and teach. That’s remember the fallen, honor those who served or are currently serving and their families, and teach our children the value of freedom,” says Linda Branam, a coordinator for the local Wreaths Across America effort. Wreaths Across America started with a viral internet photo. Morrill Worcester, owner of Worcester Wreath Company of Harrington, Maine, for years took extra wreaths and laid them at Arlington National Cemetery, near the nation’s capital. Around 2006, a picture of hundreds of the wreaths, laid by tombstones on top of the snow, captured the hearts of millions who viewed it online. It started a movement. And, it reached Clovis. 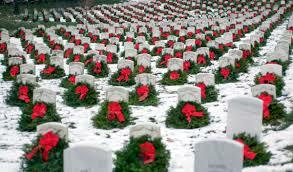 Wreaths in snow at Arlington National Cemetery. “We saw the opportunity to do the same at the holidays by honoring every veteran with a wreath,” said August Flach, a coordinator for Academy and Redbank cemeteries. Flach says the wreaths are a way to show gratitude and respect. Those sentiments are clearly evident in the commitment of locals who turn out each December to lay the wreaths and honor the memories of men and women who have served in America’s armed forces. Watch the 12 Days of Giving video above by GV Wire’s Jahz Tello to find out more about opportunities to help Wreaths Across America fulfill its vital mission.